Isaac reported to the United States Military Academy at West Point in the summer of 1996. After 4 years at the academy, Isaac graduated in May 2000. Among his honors was the General John Pershing Award for graduating at the top of his class in military tactics and studies. The day after graduation, Isaac married the former Jennifer Eilen, a fellow West Point classmate. Isaac was commissioned in the Infantry and attended the Infantry officer basic course at Fort Benning, GA, while Jenny attended the Ordnance officer basic course in Aberdeen, MD. Upon completion of the officer basic course, Isaac attended and graduated the Army Ranger school in the spring of 2001. Both Isaac and Jenny were assigned to the 82nd Airborne Division at Fort Bragg. Isaac in the 1-504th Parachute Infantry Regiment and Jennifer in the 782nd Main Support Battalion. 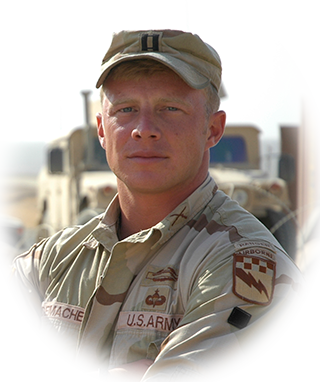 Isaac served as an Airborne Infantry Platoon Leader for two years and spent the last six months with his platoon in Operation Enduring Freedom in Afghanistan in 2002-2003. Upon his return, Jenny deployed to Kuwait in early 2003 in order to support the start of the war in Iraq. Following Jenny’s return in the summer of 2003, Isaac deployed to Fallujah, Iraq as the Battalion S5, responsible for the civil military operations within his battalion’s area of responsibility. Joe deployed with Isaac, serving as a Battalion sniper. Isaac returned in February 2004 in time for the birth of his daughter, Hunter in May. Soon after, in the fall of 2004, Isaac deployed to northwestern Iraq with the F Company, 51st Infantry Regiment – the XVIII Airborne Corps Long Range Surveillance Company. Jake joined Isaac on this deployment in the summer of 2005. Returning home in the fall of 2005, Isaac attended the Infantry Captain’s Career Course in Fort Benning, GA. Upon completion, he returned to Fort Bragg and assumed command of the Long Range Surveillance Company. After a year of training, Isaac deployed in the summer of 2007 as the commander of the Long Range Surveillance Company to Northern Iraq for a fifteen month deployment.